So there you are in front of your HF rig. You could spin the VFO knob and randomly search for active frequencies – that’s one way to do it. Or, you could leverage enabling technology of computer software, the Internet, and the community of HF operators on the air right now to find interesting QSO’s. We came across a really great suite of software. It’s called DX Lab. At the time of this writing DX Lab contains seven integrated components. Components can be combined based on your need. Combine all the components and you have an extremely powerful tool to facilitate your HF activities. For the purposes of this posting we’ll take a look at two of these seven components that work together. We’ll use SpotCollector and DXView. You use DXLab Launcher to manage the installation of any and all the components. Spot Collector is based on the concept of a DX Cluster. DX Clusters have been around a long time – before the internet was public. Before the public Internet, DX Clusters (or Packet Clusters back then) were available via Packet Radio using a protocol (AX.25) over standard VHF/UHF frequencies. Sometimes these clusters were on the Internet available to government, research, and Universities. Some folks linked AX.25 over packet radio on VHF to the Internet via Gateways. All that is ancient history. It is just to make the point that the concept of a DX Cluster is not new. In fact, Spot Collector has a legacy interface to a TNC (Terminal Node Controller) which connects to a PC via a serial port and a radio via mic and audio connections. But that’s the technology of nearly 2 decades ago. The idea of Packet/DX Clusters is old – the implementation is new. The basic idea of of a DX Cluster is to leverage HF activity reports or “spots” (what Amateurs hear on the HF bands “now”), collect these reports into a repository or database, and then provide a mechanism to distribute these reports (“spots”) to the users of the DX Cluster. In the early days, this was all line-at-a-time text based interfaces. Spot Collector is a graphical DX Cluster spot aggregator with voice announcements. That’s a lot to say in one sentence so lets break this down. First, it has a very beautiful graphical user interface. Second, Spot Collector can aggregate and combine up to 4 DX Clusters. And third, it has voice announcements. One really compelling feature of Spot Collector is the voice alerts. That is, it talks to you and announces the spots as they are received. You can turn on all kinds of filters if you like but the basic idea is this. Suppose you are interested in a certain type of HF activity. For example, activity on a certain band, from a certain country, etc. You can set Spot Collector to voice announce this activity based on a set of criteria. Or, you can leave it unfiltered and hear everything. So, its an interesting program to leave running in the background while you are doing something else. That is, keep up with HF activity without really being in front of your HF rig. For example, if you like talking on 10 meters you can filter on the 10 meter band and then go read more articles on this site. When a 10 meter spot arrives it will voice announce it on your PC and then you can go over to your HF rig and make the contact. DX View is another component of DX Lab. Spot Collector and DX View work together. If you have them running at the same time, clicking on an entry in Spot Collector will show you the location of the station on a map in DX View. 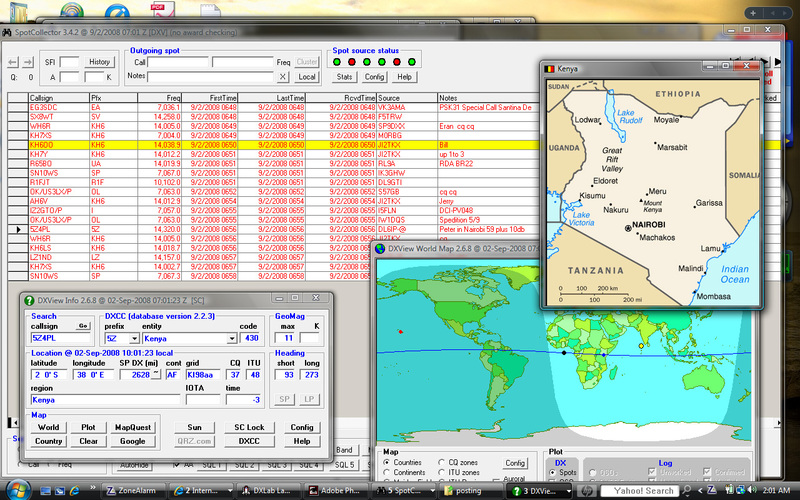 The maps in DX View have a number of overlays such as Continents, CQ Zones, ITU Zones, and ITU regions. DX View will map the spots as they arrive from Spot Collector. It gets even better than that. DX View integrates with MapQuest and Google maps on the Internet. With one click on DX View you can bring up a map of the Amateurs location on a satellite image or traditional map in a new browser window. 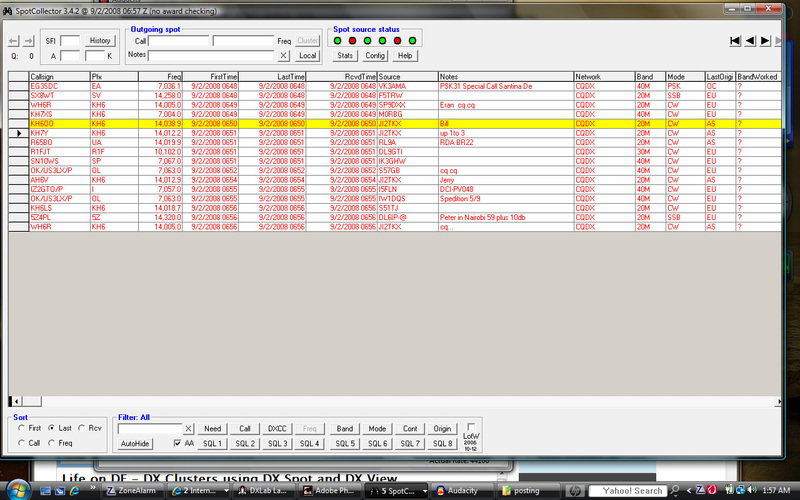 DX View gets the location (Lat,Long) by looking up the the callsigns in a database. Spot Collector and DX View are just the beginning. If you have a transceiver that is capable of PC-based control then clicking on a Spot will tune the radio to that frequency and mode if you have the installed the DX Lab component “Commander”. Add the rest of the DX Lab components and you can have it compute beam headings and control antenna rotators – if you have that capability at your station. Add WinWarbler and you have PSK31 capability. It just keeps getting better. Bottom line, the DX Lab components work in synergy and provide impressive enabling technology via the Internet. 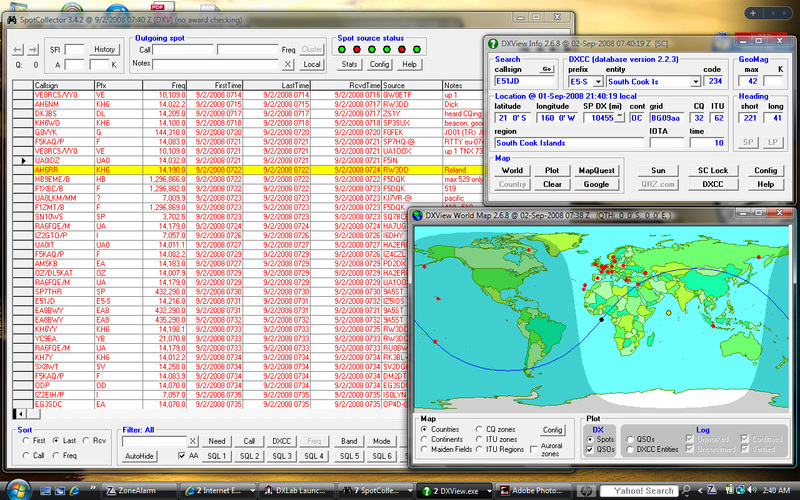 Good for the Amateur Radio community for creating this suite and making this available for free!! Best way to Learn – Hands on. The best way to learn about DX lab is to play with it – hands on. All the components of DX Lab are available for free. To get your feet wet we recommend that you just install Spot Collector and DX View. Once you have these up and running they will stat showing you HF spots almost instantly and you can try its impressive list of features. 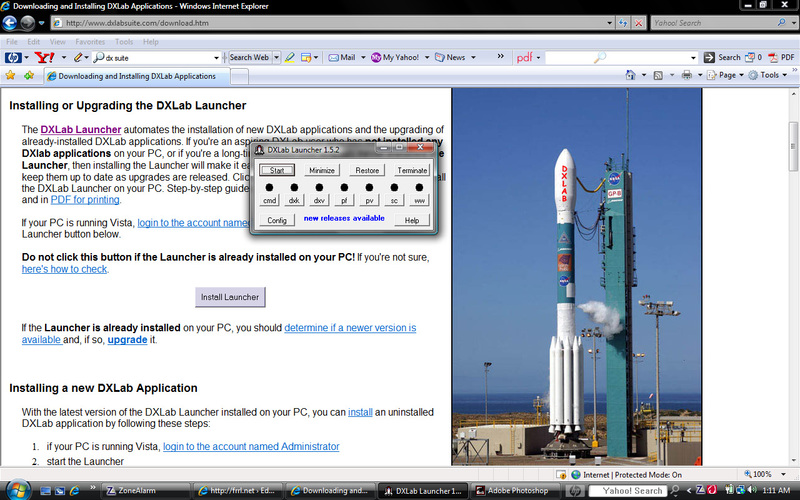 Download and install the DX Lab Launcher. 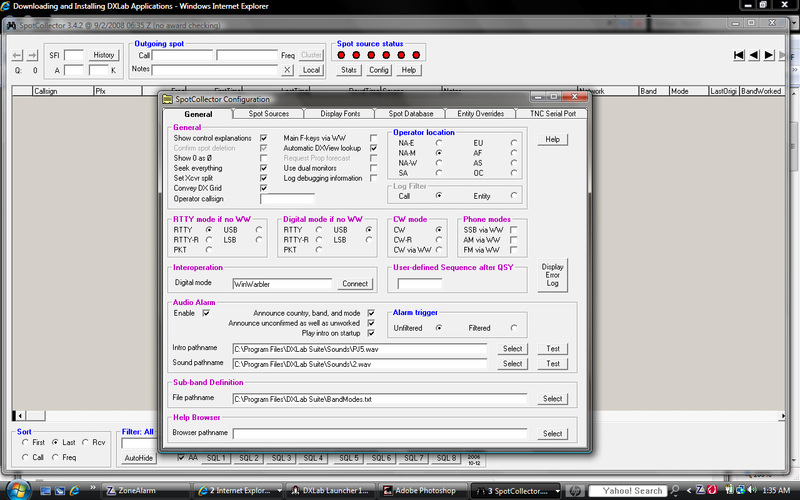 This is a control panel that you use to install any and all of the seven components of DX Lab. Use DX Lab Launcher to install Spot Collector. Make sure you choose to install the voice announcements. Start Spot Collector and set the configuration. It will ask you for your callsign and to choose the DX Clusters that you want connect to. The four possible DX Clusters are prefilled for you. You just need to enable them. Start DX View – the mapping program. Enjoy. Watch the spots come in from the DX Clusters and be recorded in a spreadsheet-like form. DX View will map the spots on a world map and provide you additional mapping capability via overlays. When the installation is complete you will see what looks like a control panel. 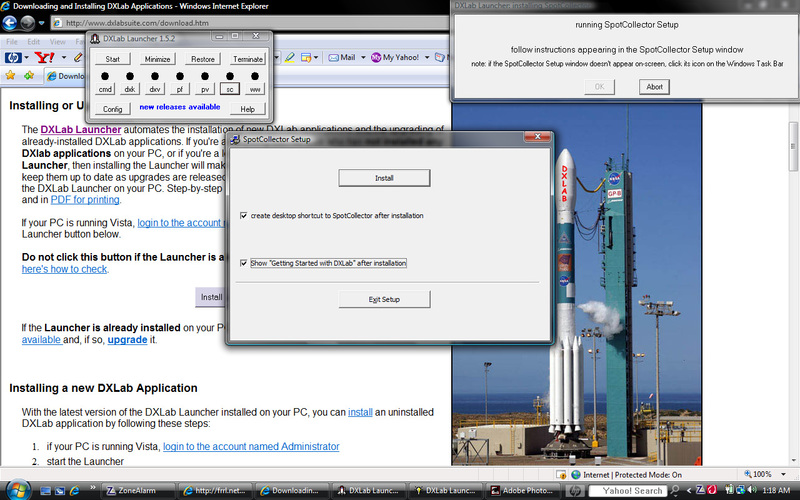 The control panel is DX Lab Launcher and it control the installation of the other components. For the easiest installation take all the defaults and complete the installation. You should now have a panel on which you can choose the other components to install. On the DX Launcher control panel click on the “SC” component to install Spot Collector. Take the program defaults and complete the installation. We suggest that you click on the boxes to create a quick lauch icon and show the help file. Don’t forget to install the audio announcements component. 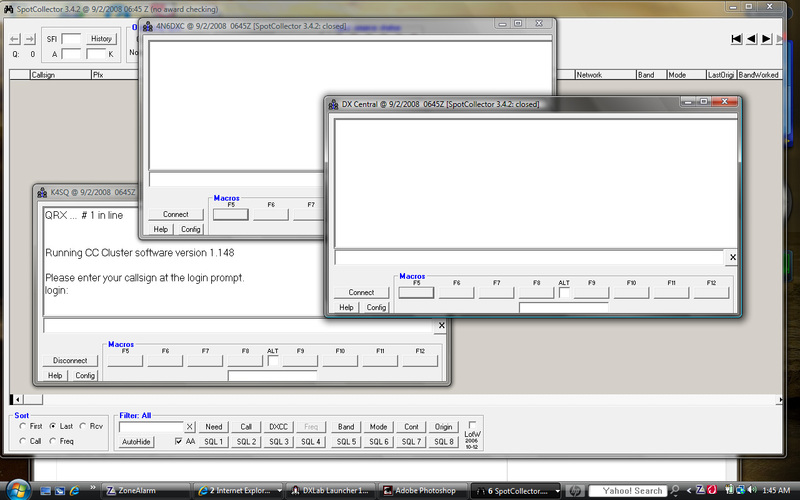 Again, using the DX Launcher control panel, click on “dxv” to install DX View. Install all the components including the country maps. From the start menu or from the quick launch icon start the Spot Collector application. Enter your callsign when asked. This will be used to tag any outgoing spots that you submit and help you login to the DX Clusters. Once Spot Collector is up and running, click on the config button near the red lights. On the general tab inspect the parameters. Make sure voice announcements are enabled. You can click on the Test button to check the volume on your PC and to ensure that voice announcements work. If they don’t work then the “sounds file” of pre-recorded audio associated with DX Lab can not be located, or the sound on your PC is not working. On the “Spot Sources” tab you can enable the 4 DX Clusters. These are the sites with which Spot Collector will communicate to aggregate spots into its database. Enable the IRC chat channel if you like. You can use this real time chat to talk to other Amateurs while you are DXing. When you enable these Cluster sites a window from the Cluster will open. Click the “connect button” and login using your callsign if requested – no password is needed. There are lots of options here. For simplicity, just login to the cluster when prompted. If all goes well, in a few minutes, you will see something like this. This is the spot activity. The red and green lights at the top show which DX Clusters are active. Click on the “lights” to open a window to that cluster. There are lots of cluster commands you can enter. We won’t discuss that in this posting. But be aware – there is much more you can do. AND you should hear the voice announcements ! Start DX View from the Windows Start menu or the quick launch icon.. Click on a line on Spot Collector to view a map of the location. From here you will find, that with one click, you can get a mapquest map or Google satellite map of the area. Amazing. We have only scratched the surface of what is possible. But this will get you started. Next time you are wondering if there is any HF activity on the bands, why not use Spot Collector instead of spinning that VFO knob? Spot Collector leverages the real-time on-air Amateur Radio community to show you what is active on HF all over the world. Use the DX View component and its mapping capability to map the geographic location of these stations. Once you get the hang of Spot Collector and DX View you can add additional components. DX Lab is a great collection of integrated programs with a huge feature set. You can use Spot Collector alone or you can use it in combination with the other DX Lab components to build up an extremely powerful tool-set for HF. It’s all free and easy to use. Best way to learn is by doing – so “have at it”.